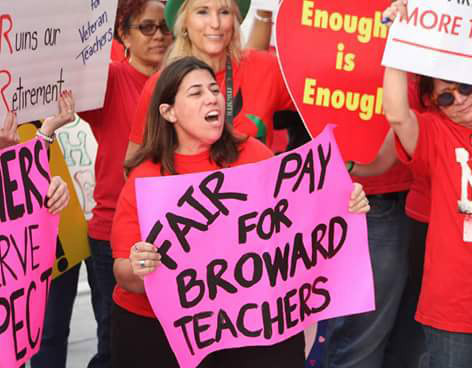 The Broward Teachers Union recognizes you have a choice in joining "your" union. That's why our entire organization is completely focused on organizing our new union brothers and sisters with the most member focused cost effective services possible. We hope by doing so, you will choose to join the thousands Broward County education and support professionals who have already made the choice to stand together -- to stand united – and speak with one collective voice. Education professionals who belong to unions have greater job security than non-union members. Unionized workplaces have better health and safety work conditions and are more likely to elect leaders and stewards who are then legally entitled to monitor health and safety at worksites. Unions have a long history of defending the rights of working education professionals. It is much more difficult for administrators to discriminate against union members who are aware and informed of their rights. Anti-discrimination laws, paid maternity leave and family leave WERE won by unions who continue to fight for improved conditions for part time and casual workers. Unions collectively and individually support education and training for staff. The benefits flow onto everyone. The Union movement has successfully lobbied state and federal governments for better laws to protect public schools and educators. People who are active in their unions learn more about their working environment and how it can be improved - they are in the best position to help better the profession and the lives of their colleagues. In tough economic times, district officials are cutting jobs. It is unions who make sure staff have a voice in this difficult process. Unions help to break down barriers in workplaces - they unite staff and create a community so members don't feel isolated and fearful. Unions are involved in important social and community issues. The Community coalition building, local and state elections, environment, civil rights, and other community concerns are just some of the social justice issues of unions.